As my research began on the Model 30 there were a considerable number of questions to be answered. To a great extent these questions have been answered. The familiar quandary is that these answerers spawn new questions and new areas to be researched. opment were impeded by the depression years. Other factors which held back sales are apparent as we continue. in the work. As desired, the rewards of this work are worth the effort. Thanks are due to the Nordic nimrod who made his rifles and time available. Another Model 30 collector provided the considerable data he had collected on specimens he had worked with over the years. These large collections allow the chance to see features and patterns as they developed over time and to see them repeated with the large quantity of specimens to know they occurred at the factory rather than being questioned as a single example of work that was performed after it left the factory. on the Model 30 began in November 1917 with the machinery used to produce 1917 Enfield still running warm. First sales of the Model 30 are reported to be in November, 1920. In a little over twenty years, total sales for the Model 30 were 22,738 units. This quantity was less than a good weeks production for the 1917 Enfield. In its best years it was only a modest success. In summary it was a financial flop. This lack of popularity will be discussed and analyzed as bring the reasons into focus. The first known advertisement for the Model 30 did not include a model number designation. Interestingly some of the early Variety I rifles also were not marked with a model number. 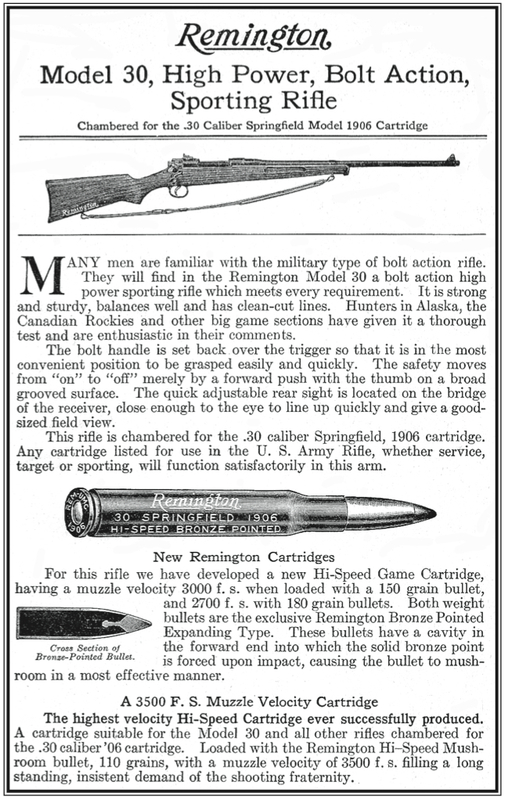 Another early flyer referred to the rifle as the Model 23. This flyer was provided by Winchester historian and author, Herb Houze. To date this is the only copy of this flyer known to exist. No other reference to the Model 23 has been found. Mr. Houze has proposed an interesting slant for its origin. His ideas will be discussed in some detail later in this writing.